A completely floating currency exists only in textbooks. Terms like dirty float or managed float refer to exchange rate regimes in which exchange rates are largely determined in foreign exchange markets, but certain interventions into exchange rates take place. Indirect interventions: Monetary policy and the growth performance of countries affect exchange rates. Therefore, a change in monetary policy is considered an indirect intervention. Additionally, trade barriers are a form of indirect intervention into exchange rates. If a country imposes a tariff on imports from another country, the import-imposing country’s currency appreciates, everything else constant. Direct interventions: These interventions imply that the central bank of a country uses its domestic currency or foreign currency reserves and engages in exchanging one currency for another. The aim may be to increase the country’s competitiveness by avoiding further appreciation of the domestic currency. For example, on September 10, 2011, the Economist reported that the Swiss National Bank (SNB) was concerned about the Swiss franc’s steady appreciation against the euro. Starting in early 2010, when the exchange rate was almost CHF1.5 per euro, the Swiss franc continued to appreciate toward CHF 1 per euro. Then the SNB stepped in and announced its determination to keep the exchange rate at CHF1.20 per euro. You can understand the SNB’s concern about strengthening the Swiss franc when you realize that the export sector of this country is vital for the economy. Direct interventions can be conducted in two ways: unsterilized and sterilized. In economics, the term sterilization is used as a countermeasure, where the countermeasure may be implemented through the changes in domestic money supply. An unsterilized intervention implies that a central bank intervenes in the foreign exchange market by buying or selling its own currency without adjusting the domestic money supply. Continuing with the previous example of Switzerland, to prevent the Swiss franc from further appreciating, the SNB can engage in direct intervention by selling domestic currency in foreign exchange markets (Swiss francs), in exchange for foreign currency, such as the dollar or the euro. This particular intervention is called an unsterilized direct intervention if the SNB doesn’t alter Switzerland’s money supply. However, if the SNB wants to alter Switzerland’s money supply following its direct intervention into foreign exchange markets, it’s called a sterilized direct intervention. The next example continues to be about Switzerland and provides a background analysis. It provides graphs for the previous definitions of unsterilized and sterilized direct interventions and explains how sterilization affects the domestic money market. First, the demand–supply model provides the necessary tools to see how the SNB can prevent the Swiss franc from further appreciating. The figure shows the market for euros. The price of the euro is measured as the number of Swiss francs necessary to buy one euro or the Swiss franc–euro exchange rate. The reason for using the euro market and the Swiss franc–euro exchange rate is that the previously mentioned Economist article reports on the Swiss franc–euro exchange rate. Suppose that the equilibrium exchange rate of CHF 1.02 indicates the exchange rate in late summer 2011, which made the SNB worry about Switzerland’s exports. If the SNB wants to achieve its goal of bringing the Swiss currency to the level of CHF 1.20, it needs to sell Swiss francs in exchange for euros. 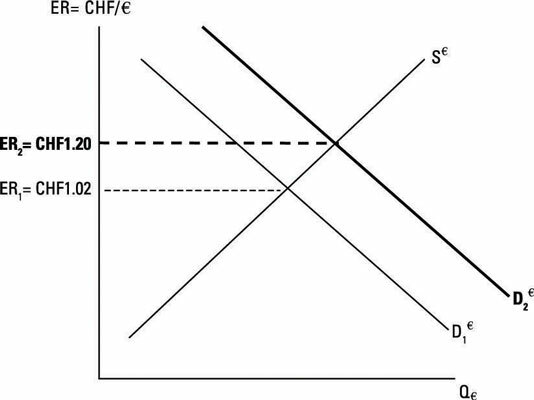 Because the curves indicate the demand for and supply of euros, the actions of the SNB are shown here as an increase demand for the euro. The SNB buys euros with Swiss francs, which essentially depreciates the Swiss franc from CHF 1.02 to CHF 1.20 per euro. So far, this example implies an unsterilized intervention, which means that the SNB intervened in the foreign exchange market without taking an independent action to change the country’s money supply. Why does Switzerland’s money supply matter? The SNB pays for euros with Swiss francs, which means an increase in the number of Swiss francs in foreign exchange markets. As the Swiss franc depreciates as a result of this action, these Swiss francs in the foreign exchange market likely will return to Switzerland as payments for Swiss exports, which may be inflationary. If the SNB is concerned about an eventual increase in inflation, it can sterilize its actions in the foreign exchange market by doing the exact opposite in the domestic money market. Because the SNB increased the amount of Swiss francs in foreign exchange markets, it can decrease the country’s money supply by selling Swiss government’s bonds (also bills and notes) to financial markets in the same amount as the direct intervention. Note that central banks cannot issue government bonds. In every country, the country’s treasury or the fiscal authority can issue new government bonds. When referring to the central bank’s sale or purchase of government bonds, you need to think in terms of secondary market bonds. All central banks hold the bonds of the relevant country’s government in their portfolio, and they can change the money supply by buying or selling these bonds. The sale or purchase of secondary-market government bonds by a central bank is called open market operations. The question is how successful direct interventions in foreign exchange markets can be. Consider the size of the foreign exchange market: It’s estimated to be up to 15 times larger than the bond market and about 50 times larger than the equity market. As of 2010, the average daily turnover was estimated to be about $4 trillion. Just compare this number to the nominal gross domestic product (GDP) of the U.S. in 2010, which was close to $15 trillion. Therefore, direct interventions are likely to be overwhelmed by market forces. Because of the size of the foreign exchange market, a coordinated effort by a consortium of central banks may be more effective. Whether carried out by one central bank or a group of central banks, the argument for direct intervention in the foreign exchange market is that even interventions of short duration may be able to reduce the volatility in floating exchange rates.